Keeping your car’s interior looking like it just came off the showroom floor is a dream that everyone aspires to. Actually turning this dream into reality is a bit of a challenge. The good news is that there are many tips to help you realize this aspirational part of car ownership. 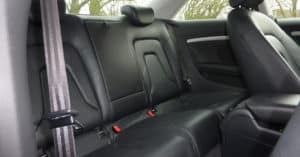 Here are four tips to keep your car’s interior sparkling clean. The crevices of your vehicle, like those found in the air vents, are harder to clean because of their size. Use compressed air to remove excess dust. Compressed air also is generally useful in reaching other crevices you can’t reach. So use it as appropriate. A sponge brush, cotton swab, or cotton ball is also effective. Just apply a light amount of your cleaning fluid of choice and attack those dirt-filled corners that are hard to reach. It’s not easy to combat dirt and grime in your car while living your life. Luckily, two household items help you do just that. A Mr. Clean Magic Eraser is a versatile tool that attacks dirt, grime, and dust. It works on almost any type of material in a vehicle’s interior. Just remember to proceed gently with leather. If you have textured vinyl in your car, a toothbrush goes a long way in removing dirt. It scrubs deeply into a textured vinyl interior to help lift out dirt. Taking steps to prevent a mess in your car’s interior saves time spent cleaning later on. Having a dedicated space to put garbage is a must. Consider using a cereal container as a receptacle. Line it with a grocery bag to make changing it out easy and to keep it clean. It prevents spills or stains on your car’s interior and keeps the car cleaner day-to-day and on long trips. Spills often end up in your vehicle cup holders, leading to a sticky mess that isn’t always easy to clean. Line your cupholders with something like a silicone muffin pan liner to save both effort and aggravation. Remove it when it needs washing and put it back in once it is clean. Did you know staying organized is key to maintaining a clean interior? Keeping things neat and tidy not only helps your car’s interior stay clean, it also ensures you know where to go for important items. For example, keep a package of auto wipes in the car. They’re useful for cleaning up messes that land outside of a cup holder. Always know where your car’s registration, manual, and vital papers are by putting everything into a zippered organizer. Don’t forget to round up any larger items in the back of the car by placing them in a box or container. You’ll know where to find them and it will keep any loose-topped containers from leaking on the trunk’s upholstery. Cleaning the interior of your car takes a little work. But working smart and using a few household items to keep it clean go a long way. It also keeps your vehicle looking in like-new condition longer.